Warm, beautiful, clean, spacious and timeless are characteristics which are often used to describe hardwood flooring in a home. The benefits of hardwood floors are many including ease of cleaning, strength and durability, better indoor air quality, good return on investment, and a high-quality, ageless look which doesn’t go out of style. There are two types of solid hardwood floors: prefinished and unfinished. While unfinished hardwood floors have been installed in homes for centuries, prefinished hardwood floors, which have been available since the late 1940s, have been gaining in popularity with consumers. 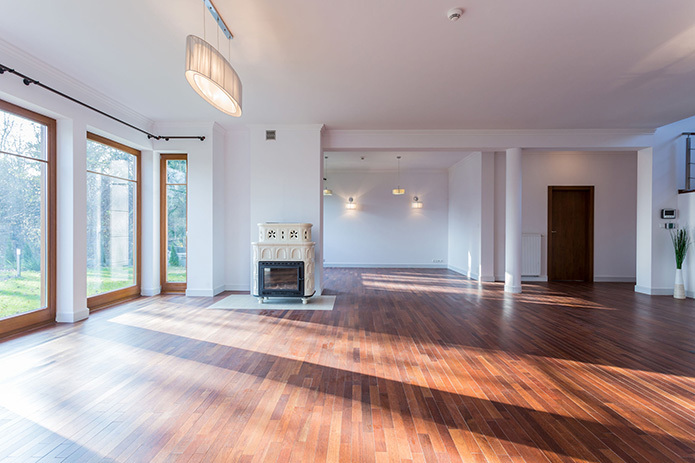 Here’s what you need to know about prefinished hardwood floors. Prefinished hardwood flooring is also called “factory finished flooring” because the stain and finish are applied at the factory when the flooring is manufactured. Unfinished hardwood flooring is shipped from the factory in its natural state with no finish. Once it is installed in a home it must be sanded, stained and then a protective finish needs to be applied. There are a number of advantages to installing prefinished hardwood flooring with one of the most compelling reasons being the actual finish that is applied in the factory. At the factory they use very powerful chemical sealers which are applied by commercial processes. These chemical sealers often consist of aluminum oxide crystals embedded in a UV-cured urethane coat, and the treatments often have warranties of 5 to 25 or more years. Aluminum oxide is much harder than polyurethane finish so the wood is much less likely to scratch or dent, keeping the wood looking good longer than unfinished hardwood flooring, which often has to be refinished every few years. Often pre-finished flooring has over five layers of urethane coating. Because it is applied by machines, it is done very uniformly. When coatings are applied in your home you typically get only two or three coats of polyurethane coating and, since it is applied by hand, it will not be as uniform. Because the coating is applied on the job site, not a controlled factory environment, dust and debris from wood sanding often become part of the final coating. These imperfections are virtually non-existent with factory applied finishes. Because of its growing popularity, there are lots of style and color options, so matching your floor to existing woodwork or wood accents is not as difficult with prefinished wood as it may have been in the past. Warranties on prefinished wood flooring vary greatly from 10 to 100 years and generally do not cover dents, surface scratches or gapping and warping.2 Maintaining a prefinished floor is easy. You just vacuum or sweep grit away, then mop with a cleaner recommended by the manufacturer. If you take care of your prefinished floor it will last for centuries, aging as gracefully as your home does. Cameron the Sandman offers new hardwood floor sales, refinishing, replacement and more. We work with EVERY species of wood in a host of styles and stains. Also, because there is a lot to know about a hardwood floor, you can count on our design professionals to educate you and help you select the perfect hardwood floor for your Metro Detroit home. Contact us at 248-477-8108 today to learn more!